I don't know what came over me, but the other day I felt compelled to try my hand at a new artistic medium - painting. Of course I had to choose a subject that is compelling to me - turkeys! 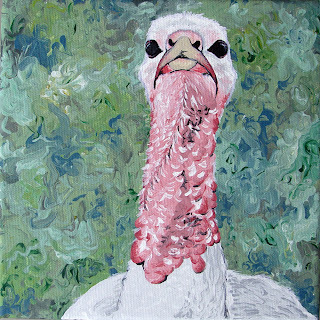 More specifically, my dear Blossom, one of our two rescued turkeys. She's adorable! That is a great painting too. I can't believe its a new medium for you.